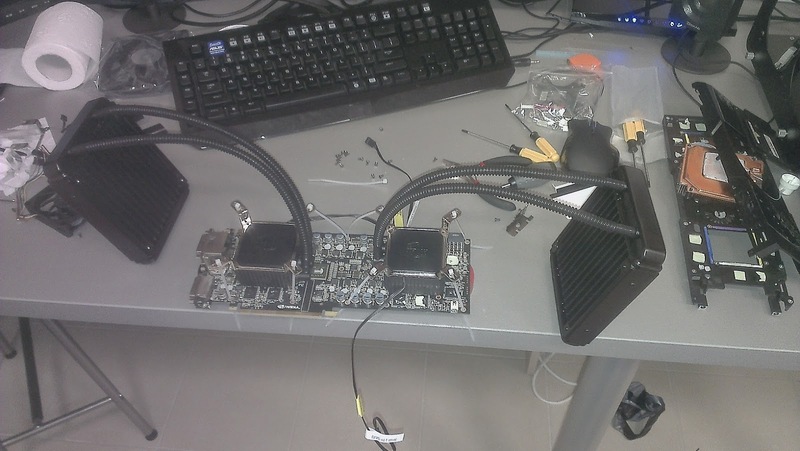 So this how I decided to cool my GTX 590 for when I try benching it with an addon VRM. The coolers I used are Coolermaster Seidon 120Vs. I flipped the intel mounting bracket upside down removed the PCI-e slot bracket and used zipties to attach the coolers to the card. The first unit has zipties going through holes 1, 3, 15 and 16. The second unit has zipties going through holes 3, 5, 17 and 20. On my first mounting attempt I managed to bend the PCB by tightening the zipties too much. Luckily I just had to redo the mounting. The end result of this is that the GPU takes up ALL expansion slots bellow it. I do believe that you could do the mounting slightly different and reduce the number of occupied slots to just 5 but for my purposes of running the card on a test bench this mounting proved most effective. Another thing that isn't necessary is removing the PCI-e slot bracket because you can have that attached by the DVI ports without having it take up screw hole #1. However even with the PCI-e bracket this is definitely not something you would want sitting in your tower case but it is great for open air test benches and it manages to run the card at 51C at stock clocks which is a 34C improvement over the stock cooler. The other good thing about this cooling method is that you still have enough space to attach addon VRMs like the EVGA E-power.